Pettakere Cave in Sulawesi. Source: National Geographic. While everyone’s competing for who has the oldest cave art, something else mysterious has been discovered on the island of Sulawesi in Indonesia. Ok, well maybe it’s not that mysterious, but to me anything that sheds light on human history beyond the last 10,000 years is worth a read. The island of Sulawesi itself is of particular interest to me, because of its location in “Wallacea.” To explain my fascination in simple terms, Wallacea is almost its own continental plate, separate from both the Australian and Asian continental plates. While the neighboring Java sea is barely 100 meters deep, the waters surrounding Sulawesi drop to several thousand meters in depth. So what exactly does this mean? This means that even during the ice age days (when sea levels were lower and what may be an archipelago now may have been just one piece of land then) Sulawesi was STILL an island. 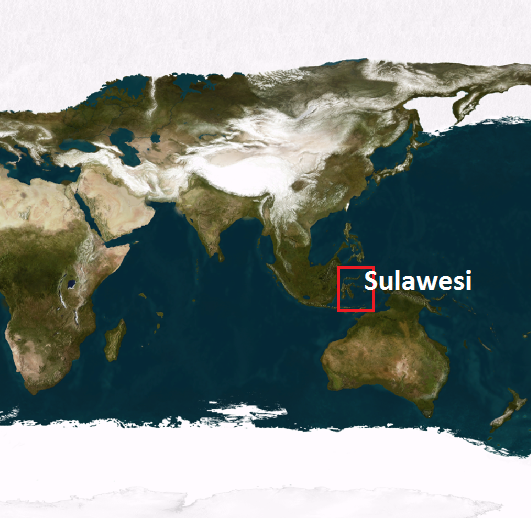 Sulawesi during the Ice Age -- Still an Island. This means that unless Sulawesi was the cradle of civilization (most studies confirm otherwise), early (ancient) man would have had to sail in order to have reached Sulawesi to begin with. With that, we'll have to tackle the theories of when ancient man first set sail, but that's a story for another day. 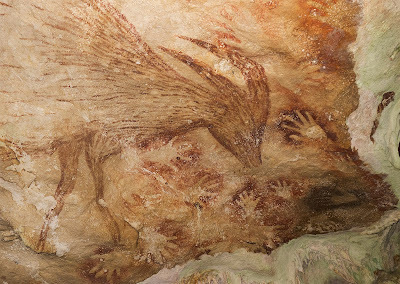 I’ll take the moment to add that the world’s oldest cave art is also in Sulawesi. The Pettakere Cave stencils have been dated to the Paleolithic era, estimated at 39,900 years old. So, back to that latest discovery. Archaeologists in Indonesia have discovered yet another ice age cave in Sulawesi, with artifacts dating to roughly 30,000 years ago. 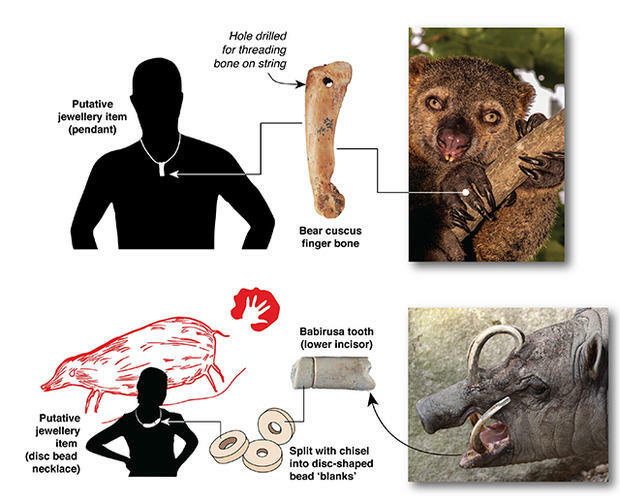 The ornaments include carved items made from animal bones and tusks. Archaeologists suggest that they may have been worn as jewelry. Image Source: Prepared by M. Langley and A. Brumm; bear cuscus bone image is courtesy of Griffith University/Luke Marsden. Lead archaeologist Adam Brumm believes that this discovery shows a symbolic culture and the ability of early humans to create art. Ancient archaeological finds around the region are scarce compared to places like Europe. However, discoveries like these add to the emerging picture of an early civilization in a region where there was thought to be none. Now it is clear that there is.